Volunteers are a crucial part of everything we do. In fact, they keep the Center running. Their dedication and contribution of time enable us to offer our diverse selection of programming. Learn more about a few of our amazing volunteers below—our Program Leads. You can get involved by joining our team of volunteers. Sign up to volunteer by filling out our online application. We’ll get back to you promptly. Ketzel Levine helped create NPR’s Morning Edition, put legendary broadcaster Red Barber back on the air, covered baseball, classical music, climate change, and as an NPR senior correspondent, reported from places as varied as Britain, South Africa and Brazil. 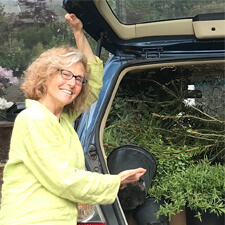 Because of her passion for plants and horticulture, Ketzel became NPR’s gardening expert, the “Doyenne of Dirt” and talked plants on Saturday mornings with Scott Simon for ten years. She moved to Portland in 1996 and is now setting down roots locally with her Golden, Milo, who doesn’t do laundry but does entertains guests at their airbnb Sea, Sit, Stay! atop Neahkahnie. 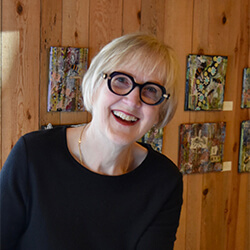 Tela Skinner has been a volunteer for several Hoffman Center programs since 2008: Manzanita Writers’ Series, visual arts and the Hoffman Gallery, Travelogue, fundraisers, member and donor parties. She also served on the Hoffman Center board for four years. Currently, she works with a team of volunteers providing presentations and discussion topics for the Art of Aging & Dying Series. Sharon Gibson is co-lead of the Clay Program where she has been working with clay and volunteering at the studio since 2013. Sharon manages some of the day-to-day operations of the program and represents the program on the Hoffman Center Board. She enjoys the opportunity to grow a thriving clay community while literally getting her hands dirty. In 2013, after many years practicing medicine, Steven Gibson retired. Within a week, he took his first class at the Hoffman Center. He had thought for years about making pots as a creative outlet and felt so fortunate that the center was in the neighborhood when he finally had the time. Since that first life-changing moment of touching clay, he has spent many hours creating functional ceramics at the wheel, managing the kiln, and volunteering in many capacities at the Hoffman Center and the clay studio, where he co-leads the clay program. David Dillon has been involved with the Hoffman Center since its creation in 2004 and was a friend of Lloyd and Myrtle Hoffman. He is a cinema aficionado and appreciates the power of storytelling using moving images and sound. 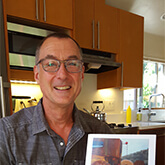 He started The Manzanita Film Series in 2009 to spotlight short and feature-length narrative and documentary films created by artists around the Pacific Northwest, while occasionally exploring the world of international short films. In Spring 2016, Mary Roberts visited the Hoffman Center clay studio and fell in love. Eager for the clay program to thrive, she began hosting, teaching, marketing, and helping organize studio fundraisers. By December, Mary started monthly ceramics shows in the Hoffman Gallery and a year later, volunteered as gallery manager. 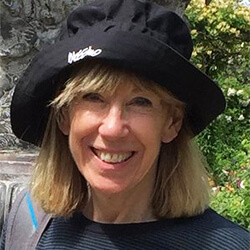 Mary has a 35-year career in growing branded companies that design, make and retail products directly to consumers. She has served on the board of numerous arts and community related not-for-profits in Portland. 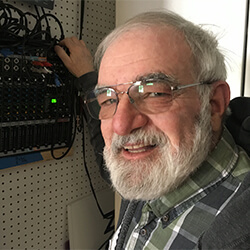 Fueled by his lifelong interest in music, Gary Seelig serves as the live music performance organizer for the Hoffman Center. He helps bring local and distant musical talent to the Hoffman stage. Since turning 60 he began to practice and now plays guitar in a few local bands and lives full-time in Manzanita. Toni Greening began volunteering at the Hoffman Center in 2017. Her time is spent working with artists to create workshops that reach artistically diverse audiences. She finds the coastal community rich in talent and generous in sharing time and skills. She spends about half of her life in Manzanita and the other half in Portland, which is sometimes confusing to her dog Porter. She feels fortunate to have found a rewarding outlet for her twenty-five years’ experience in executive management, and nonprofit leadership. 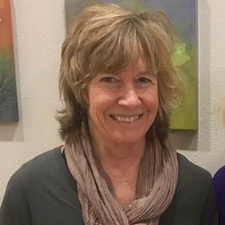 Jeanine Rumble created the Hoffman’s Fiber Art Circle in October 2017. 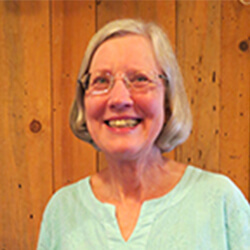 She has experience in spinning, knitting, quilting, tapestry weaving, silk painting, and felt sculpture. She enjoys encouraging others and believes in the open exchange of ideas and techniques. Working in a creative community is vital to her growth as an artist. Her other interests include genealogy, history and travel. She is a retired medical research ethicist and lives in Manzanita. 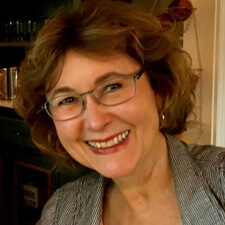 Vera Wildauer has been involved with the Hoffman Center since 2008 and helps bring authors, publishers, and writing instructors to our area. 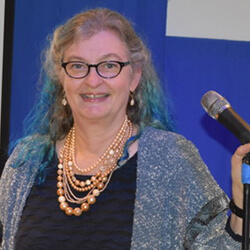 As co-founder of the Manzanita Writers' Series and North Coast Squid literary journal, she is delighted to bring opportunities for learning and community to local and visiting writers. 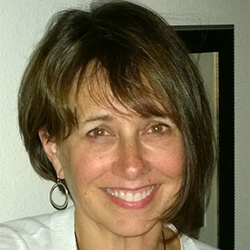 Prior to moving to Manzanita full-time, she had 20+ years experience as a marketing professional and non-profit board member. 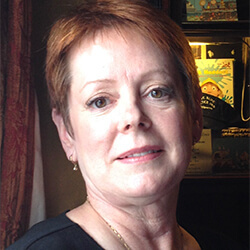 Kathie Hightower has been involved with the Hoffman Center since 2008. As co-founder of the Manzanita Writers' Series, she loves creating a robust writing community at the coast. 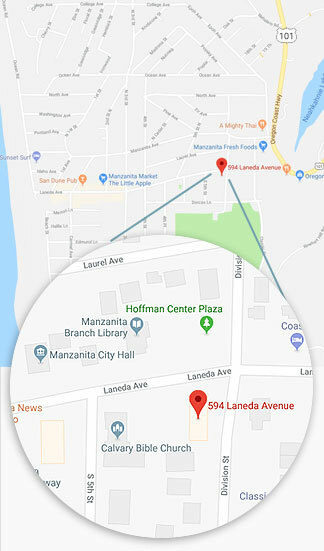 Before moving to Manzanita full time, her years in advertising sales, ad agency marketing, Army Reserve Public Affairs, and international speaking, built up skills that come in handy with the program marketing and presentation. 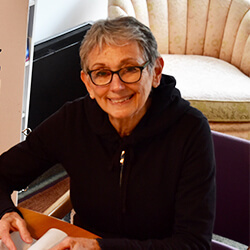 Marcia Silver has taught writing on both coasts at a variety of colleges and universities, focusing on working individually with students and faculty on projects they then carried into the world. She has also been a consultant to businesses and nonprofits as well as editor to local authors. 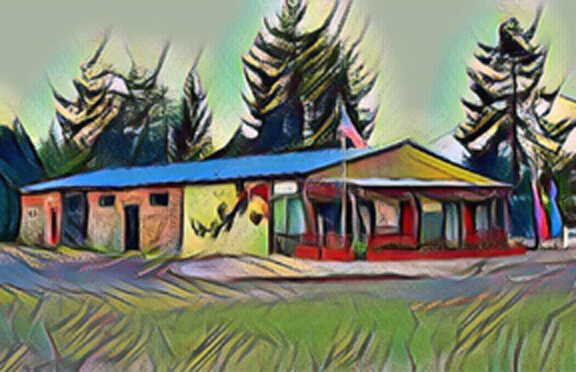 She has owned a cabin in Manzanita since 1997, making it her full-time home in 2013. Phyllis Mannan has a memoir, Torn Fish: A Mother, Her Autistic Son, and Their Shared Humanity and is about to publish her first poetry chapbook. Her poems and nonfiction pieces have appeared in The Oregonian, Rain Magazine, StringTown, Willow Springs, and other publications. 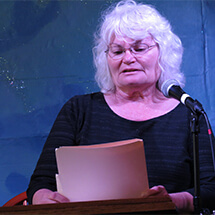 Her years of connection to the Portland poetry community and her love of poetry are put to work producing the annual PoetryFest. She lives with her husband in Manzanita. Emily Ransdell divides her time between Manzanita and Camas, WA. Her poems have appeared in Timberline Review, The Cortland Review, Rattle, and elsewhere. She was featured on Ted Kooser's American Life in Poetry and has been nominated for a Pushcart Prize. After years of marketing work for HP, she’s turned her energies to completing her MFA in Poetry. Andy Barker taught creative writing as a high school English teacher before retiring two years ago. He splits his time between Manzanita and Portland. 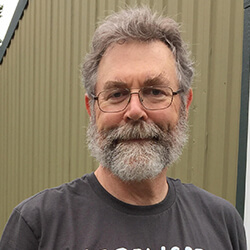 His years as an advisor to an award-winning student journal are being put to work as editor of the North Coast Squid Literary Journal. His stories have appeared in journals including the North Coast Squid and Rain Magazine.